Do you ever think back to how optometric practice was before OCT? It is a scary thought, I know. It truly amazes me how much technology we have at our fingertips these days. For the most part, that’s a good thing. However, I fear that my students have become more dependent on OCT at the expense of their clinical exam skills. I often remind them that technology should be used as a supplement to their physical exam. But in reality, it’s often the OCT that weighs most heavily into my treatment and referral decisions. I like to ask my students to picture how they would practice without an OCT. However, as a 2010 optometry school grad myself, I have never worked in a setting that did not have one. Nowadays, the have become ubiquitous within any medical Optometry practice. As I have always had access to this technology, I should ask myself, would I be able to function without it? Although I’d like to believe I would be fine, I most likely will never have to find out. One last note, if you look at the “You Make the Diagnosis” section of the newsletter, you may notice a trend to feature optometry resident cases. It can be hard for residents and young practitioners to present their work. This newsletter is an excellent forum to do so. Please take a look and see what interesting retina cases these residents are encountering. Well fall is upon us, unless you live in SoCal like I do and it still feels like summer. Fall means the kids are back in school, football is on (Go Patriots! ), baseball is heading into playoffs (Go Red Sox!) and conference season is upon us, with lots of great options. There is Vision Expo West in Vegas, East-West in Cleveland, and GWCO in Portland, just to name a few, as well as a ton of state meetings. I personally will be in Kentucky, Connecticut, and Mississippi for their meetings, and really look forward to it. Another great option is to come join us for our annual ORS meeting, RETINA UPDATE 2018, held November 30 to December 1 at the Fairmont Scottsdale in Scottsdale, AZ. The conference will include 11 hours of CE, including a two-hour hands-on technology workshop, and will have wonderful speakers such as Jeff Gerson, Leo Semes, Mohammed Rafieetary, Brad Sutton, and myself. Answer appears later in newsletter. 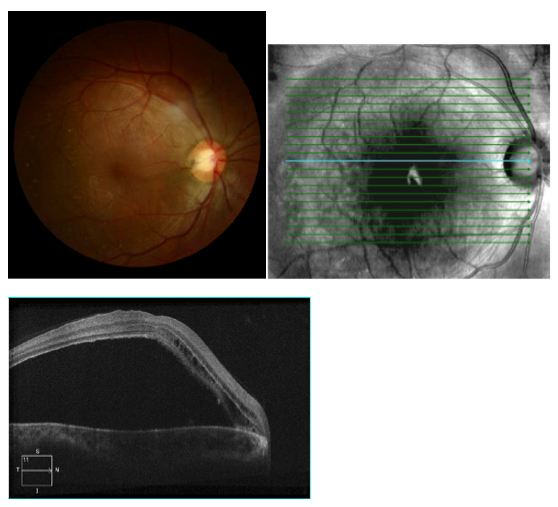 Which of the following sets of fundus autofluorescence images represents chronic central serous retinopathy (ICSC/CSR)? Answer appears later in the newsletter. Combination Therapy with Dietary Zeaxanthin for Neovascular Age-Related Macular Degeneration. A Randomized Clinical Trial. The neovascular form of AMD (nAMD) is characterized by the development of choroidal neovascularization (CNV). 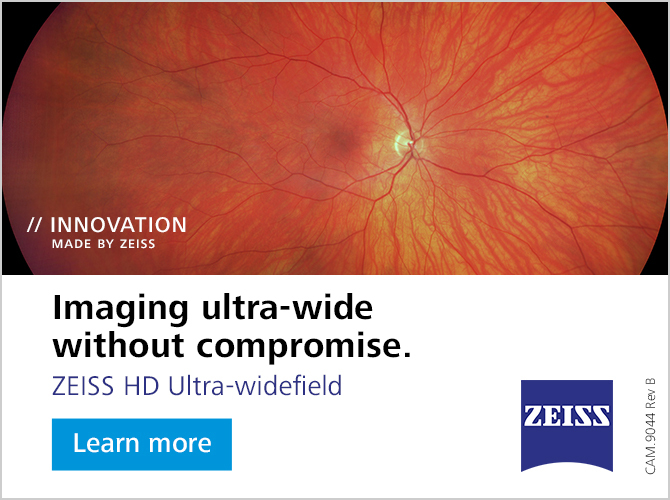 Though it represents a minority of cases, nAMD is associated with 80% to 90% of visual loss. It is clear that no single therapy addresses the multifactorial pathogenesis of the disease. A previous comparative interventional study suggested oral zeaxanthin added to triple therapy of intravitreal bevacizumab, intravitreal corticosteroids, and photodynamic therapy with verteporfin for the treatment of nAMD was comparatively effective and cost-effective. A randomized clinical trial was undertaken to confirm these effects. A two-year, triple-blinded, randomized clinical trial enrolled 144 participants (168 eyes) with nAMD to triple therapy (TT) (intravitreal bevacizumab, reduced-fluence photodynamic therapy and intravitreal dexamethasone) or the same triple therapy with oral zeaxanthin (TTZ) supplementation, 20 mg daily. Data were modeled out to the 11- year life expectancy of the average participant. At 24-months, 27% (17/62) of TTZ eyes gained ≥ 15 letters, vs. 9% (7/81) of TT eyes (p=0.003). Among unilateral, nAMD participants, nAMD developed in 23% (12/53) of TT and 6% (3/47) of TTZ fellow eyes with atrophic AMD (p=0.02) by 24 months after baseline. The incremental cost-utility ratio of oral zeaxanthin supplementation was a remarkably low $30/QALY (quality-adjusted life-year). Zeaxanthin supplementation to TT is cost-effective in every country since the 11-year cost of TTZ ($14,486) exceeds the cost of TT ($14,480) by only $6, yet provides a 0.200 QALY gain. Oral zeaxanthin supplementation of triple therapy for the treatment of nAMD is comparatively effective because it yields improved vision and reduces the incidence of subsequent nAMD in fellow eyes with atrophic AMD by 74%. Oral zeaxanthin supplementation is cost-effective in the U.S. and worldwide referent to most ophthalmic interventions. Olk RJ, Peralta E, Gierhart DL, et al. Combination therapy with dietary zeaxanthin for neovascular age-related macular degeneration. a randomized clinical trial. J Clin Exp Ophthalmol 2017;8(5):692. This retrospective, population based study was designed to determine the risk between vitreoretinal surgery and the secondary development of glaucoma. The data is from residents of Olmsted County, MN, who had vitreoretinal surgery, whether scleral buckle (SB), scleral buckle with vitrectomy (SBV) or vitrectomy alone (PPV). The non-operative eyes were used as a control. Any eyes with a prior history indicating glaucoma or glaucoma suspect were excluded. Records were reviewed to look for conversion to POAG, POAG suspect or OHTN. Development of a secondary glaucoma was excluded. Of the 688 patients identified with procedural codes consistent with one of the three subgroups of vitreoretinal surgery, 344 met the inclusion and exclusion criteria. There were 277 non-operative eyes for comparison. The two operative and non-operative groups were similar, aside from baseline visual acuity and lens status. Average follow-up was 62.1 ± 38.4 months. The most common causes for PPV were epiretinal membrane (37.1%), macular hole (33.2%) and vitreous hemorrhage (13.1%). Expectedly, rhegmatogenous retinal detachment was the most common reason for SB or SBV. The authors found the 10-year cumulative probability of developing POAG in the operative group was 8.9% vs. 1% in the non-operative eyes. Interestingly, POAG did not develop in the SB group, compared with 11 eyes in the PPV group and four eyes in the SBV group. The 10-year cumulative probability of becoming a POAG suspect was also higher in the operative group at 27.7% vs. 15.5% in the non-operative group. Again, this was more common in the SBV and PPV groups over the SB group. Overall, the chance for development of POAG or POAG suspect was much higher in the vitrectomy groups (SBV and PPV) compared to non-vitrectomy (SB alone) with a hazard ratio of 6.0. The authors also considered that the indications were different in the vitrectomy groups, whereas in the SB group all eyes had rhegmatogenous RD. This was accounted for with a survival analysis of those eyes across all groups with just rhegmatogenous RD and still the probability of POAG/POAG suspect was higher in the vitrectomy eyes over the SB cohort. The non-operative eyes fared similarly to the general population of Olmsted County in terms of development of POAG. However, the operative eyes, in particular with vitrectomy, had a significantly greater rate of POAG development. This study concluded that eyes post vitrectomy surgery had a 10-17 fold risk for development of POAG. This suggested a need for increased monitoring for POAG post-vitrectomy and discussion with patients prior to surgery of this risk. Future study is necessary to understand the mechanism by which this occurs. Mansukhani SA, Barkmeier AJ, Bakri SJ, et al. The risk of primary open angle glaucoma following vitreoretinal surgery- a population-based study. Am J Ophthalmol. 2018; Jun 22. [Epub ahead of print]. The guidelines for dosing hydroxychloroquine (HCQ) have fluctuated over time with debate revolving around whether real body weight (RBW), ideal body weight (IBW) or the lesser of the two should be used in calculating the daily dose. Daily dose is the only adjustable risk factor when it comes to lowering a patient’s risk for HCQ retinopathy. This was a retrospective study that looked at the impact of somatotype, in terms of body mass index (BMI), on risk of HCQ retinopathy and whether dosing should be based on RBW, IBW or lesser of the two. In total, 865 patients on HCQ for autoimmune disease were analyzed. All patients had to have had at least one ancillary screening test for retinopathy: 10-2 visual field, SD-OCT, multifocal ERG (mfERG) or fundus autofluorescence (FAF). They also had to have height and weight recorded in the chart. All testing was reviewed by a single independent reviewer to verify agreement with clinical diagnosis. Of the 865 charts reviewed, 565 patients fit the criteria for inclusion. Almost all patients (562, 99.5%) had a visual field performed, 355 (62.8%) had a VF and SD-OCT while 240 (42.5%) had a VF and mfERG. The patients were mostly Caucasian (418/565) or African American (115/565). The study used receiver operating curves to quantitate the accuracy between dosing off IBW, RBW or the lesser between IBW or RBW. In univariate analysis of each daily dosing method, the area under the curve (AUC) was highest using the lesser between IBW/RBW (0.76), then RBW (0.72) and IBW (0.71). In multivariate models, using gender, age, cumulative dose and BMI as variables, the AUCs were 0.82 for IBW, 0.82 for RBW and 0.83 for the lesser between RBW/IBW. In all the multivariate models, lower BMI had higher risk of retinopathy. In conclusion, the authors found short, asthenic women at higher risk to develop HCQ retinopathy. In addition, contrary to the American Academy of Ophthalmology guidelines, they found dosing of the lesser value between RBW and IBW better for short, obese women. This suggested that the current accepted standard of <5 mg/kg/RBW/day is not appropriate for all somatotypes. This study had limitations including a single grader, retrospective nature, and patient self-reporting of medication use. Overall, a prospective, controlled study would be ideal to truly settle this debate and determine the best method to decrease risk for HCQ retinopathy. Browning DJ, Lee C. Somatotype, the risk of hydroxychloroquine retinopathy, and safe daily dosing guidelines. Clinical Ophthalmology. 2018;12:811-8. Retinal vascular occlusions are a rare but significant known complication of cosmetic facial filler injections. This article presented a case of retinal and choroidal vascular occlusion after peribulbar triamcinolone injection. It is believed to be the first reported case involving the choroidal circulation. A 48-year-old Chinese female received a peribulbar injection of 20mg/ml triamcinolone for the treatment of thyroid-associated ophththalmopathy. Approximately 20 minutes after the injection, she reported a severe, acute loss of vision in the left eye accompanied by a sensation of swelling and pain. An immediate examination of the fundus revealed deposits of whitish material in several areas of both the retinal and choroidal vasculature. Interestingly, a subconjunctival hemorrhage with chemosis was also present. Vision was light perception only, and there was a marked APD. Immediate treatment was attempted via several measures including anterior chamber paracentesis, ocular message, instillation of multiple types of IOP lowering drops, sublingual glyceryl trinitrate, and IV alprostadil. Upon examination the next day, the fundus was seen to exhibit retinal ischemia/whitening with a classic cherry red spot. Approximately one month after the original event, all of the triamcinolone particles had been absorbed, and vision had stabilized at 20/400. While it is clear that retinal vascular occlusions are a potentially devastating complication of facial and periocular injections, the exact mechanism by which this occurs remains somewhat uncertain. Theories include anastomoses within the facial artery system leading to retrograde ocular embolization, inadvertent direct arterial injection, and very forceful injection leading to ophthalmic artery embolization. No matter what the exact mechanism may be, it is very important for eye care practitioners to be aware of this often visually catastrophic complication. 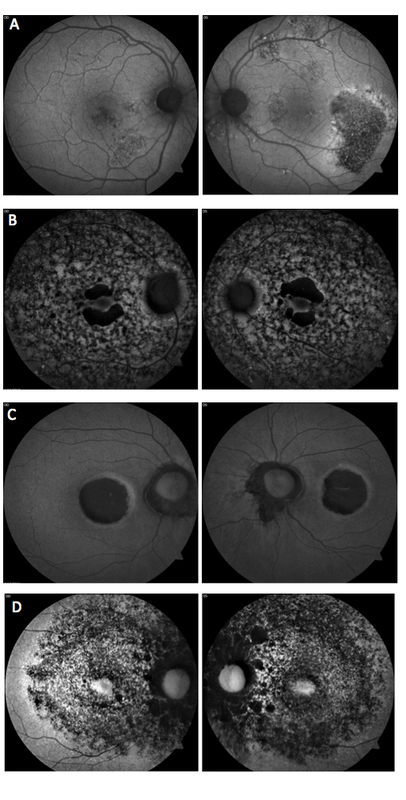 Li G, Xu D, Hu Z, Li H. Embolic retinal and choroidal vascular occlusion after peribulbar triamcinolone injection: a case report. Medicine. 2018;97:17. It is well-established that migraine sufferers often experience visual auras that typically precede or sometimes accompany their headaches. These bilateral auras are the result of cortical neural activity. They usually consist of scintillating scotomas that build to a crescendo and last anywhere from five to 60 minutes, averaging around 20 minutes. Monocular scintillating scotomas can also occur due to direct effects on the retinal vasculature, and these are often termed retinal migraines. However, these visual phenomena can also take the form of scotomas with visual field loss in the absence of any positive visual component. These scotomas typically resolve over a similar time period, but have rarely been reported to be permanent. They are believed to be due to vasospasm, often resulting in dilated retinal vasculature in the affected area for a period of time after the event. This article highlights another manner in which migraine-associated retinal vasospasm can affect vision. A 60-year-old Caucasian male reported complaints of an inferior visual field defect in his right eye that had been present for one day. He had noticed the visual field defect the day before after experiencing a migraine headache, which had lasted around 30 minutes. Interestingly, he reported that this had happened to him hundreds of times associated with migraine headaches over the last three decades, always in his right eye. He had been extensively evaluated by both ophthalmologists and neurologists over the years and had been found to have no retinal abnormalities. In the past, the visual field defect had always resolved, but this time it persisted. Upon examination, vision was 20/20 in each eye but there was an inferior altitudinal visual field defect in his right eye and a mild APD in that eye as well. Fundus examination of the right eye revealed retinal whitening / ischemia in the superior half of the retina with a single, small peripapillary flame hemorrhage. There was no visible embolus, and the fovea was spared. The left eye was entirely normal. A diagnosis of superior hemiretinal artery occlusion was made, and the patient was referred to a stroke unit for systemic evaluation. Exhaustive investigation revealed no abnormalities, and no potential embolic sources. One month after the event, the patient’s retinal ischemia had drastically improved, his vision was stable at 20/20, and his inferior visual field defect persisted. While it is true that migraine-related visual auras can be associated with permanent visual deficits, this is rare. When a migraine-associated visual field defect persists well after the event, it is imperative that the cause be investigated. In this case, the retinal vasospasm associated with migraine led to a hemiretinal artery occlusion with accompanying permanent visual field loss. In instances such as this, a full systemic cardiovascular evaluation to investigate possible embolic sources must be carried out, but the results are frequently unremarkable. Christakis P, Alon R, Brent M. Recurrent visual field defect associated with migraine resulting in hemiretinal artery occlusion. Can J Ophthalmol. 2018;53(3):92-4. Cystoid macular edema (CME) is a well-known complication of cataract surgery. Visually significant CME affects up to 2% of patients after surgery, while non-vision threatening CME that is detectable only with OCT or IVFA can affect up to 30% of patients. It is also recognized that the use of prostaglandin analogs after surgery increases the risk of CME. But might another IOP-lowering agent do so as well? This article examined the effect of both postoperative prostaglandins and beta-blockers on the incidence of CME after cataract surgery. The Pharmetrics Plus database, a national database consisting of adjusted insurance and pharmacy claims, was used to assess patients who had undergone cataract surgery between January 1, 2006, and December 31, 2016. The only exclusion criteria was diabetes. A total of 508 cases of CME that were coded for on insurance claims were discovered, and each of those cases was then paired with 10 controls (for a total of 5,080) who were matched for age, gender, and follow-up time. These controls had undergone cataract surgery but had not been diagnosed with CME. The pharmacy prescription records were then utilized to find individuals who had been given a script for topical beta-blockers or prostaglandins after surgery. Of course, this made the assumption that the prescriptions were actually filled and the medication was taken, an admittedly big assumption. Both current use, defined as a prescription within 30 days of CME diagnosis, and previous use, defined as prescriptions within one year of CME diagnosis (but after surgery), were studied. Prostaglandins and beta-blockers were each significantly associated with an increased risk of CME, both with current and prior postoperative use. Interestingly, beta-blockers (relative risk 2.64 with current use) were actually more highly associated than prostaglandins (relative risk 1.86 with current use). Additionally, bimatoprost and travaprost were much more highly associated over latanoprost, so much more so that they were each individually more highly associated than beta-blockers. So while practitioners may be wary of prostaglandins after cataract surgery, perhaps we should also be thinking more about topical beta-blockers as a potential cause of concern in relation to the development of CME. Wendel C, Zakrzeweski, Carleton B, et al. Association of postoperative topical prostaglandin analog or beta blocker use and incidence of pseudophakic cystoid macular edema. J Glaucoma. 2018;27(5):402-6. This study was a retrospective review of medical records of patients who presented between January 1, 2005, and December 31, 2017, with endophthalmitis associated with intravitreal anti-VEGF injection. The study reviewed 39 eyes, 27 of which referred and 12 seen at Bascom Palmer Eye Institute (BPEI) initially for intravitreal injections. Vitreous fluid cultures were obtained in all patients. Prophylactic use of antibiotics before or after the injections varied as this protocol was phased out starting in 2008. By 2012, prophylactic topical antibiotics were no longer used at BPEI. A large portion of the cases referred came at a time when there was an outbreak of Streptococcus endophthalmitis due to a contaminated batch of bevacizumab. Of those receiving the injections, most were in the treatment of wet AMD. Otherwise, the reason for treatment was CME, DME, central and branch vein occlusions, or idiopathic choroidal neovascularization. Bevacizumab was the most commonly injected medication in 59% of the cases reviewed. Ranibizumab, aflibercept, pegaptanib and an unspecified anti-VEGF drug were the other medications injected. All the patients presented within eight days with an average presentation of three days post injection. Intravitreal vancomycin (1mg/0.1 mL) and ceftazidime (2.25mg/0.1mL) were the initial and recommended treatments of endophthalmitis. Staphylococcus, Streptococcus, Staphylococcus warneri, were the most common causative agents, while S. aureus, Bacillus, and Haemophilus influenza were also found. Those presenting with Staphyloccoccus as the cause had clinically the best VA outcomes, with 18 of the 22 eyes reaching 5/200 or better. On the other hand, only two of 15 reached 5/200 or better of those with Streptococcus endophthalmitis. The authors found the worst result in visual acuity occurred in patients who presented within three days and with a species of Streptococcus. The thought process was that those presenting earlier had a more serious strain, with clinical symptoms presenting early. The rate of developing endophthalmitis after an intravitreal anti-VEGF injection is one in 7,000, and this has been found to be similar throughout the different anti-VEGF agents. Although rare, endophthalmitis is a serious complication to intravitreal injections and should be treated immediately, as listed. Yannuzzi NA, Gregori NZ, Rosenfeld PJ, et al. Endophthalmitis associated with intravitreal injections of anti-vegf agents at a tertiary referral center: in-house and referred cases. Ophthalmic Surg Lasers Imaging Retina. 2018;49(5):313-9. The PROMETHEUS study was a 12-month, Phase III, double-masked, randomized, sham controlled multicenter study to evaluate the effectiveness of ranibizumab 0.5 mg for uncommon causes of macular edema. All participants suffered from macular edema from a cause other than diabetic retinopathy, retinal vein occlusions, or wet AMD. There were 156 participants that completed the study. Patients were randomized 2:1 into a treatment group or sham group. Those in the treatment group received ranibizumab 0.5mg injections. Those in the sham group received sham injection at baseline and at one month. At month two, both groups were receiving open-label ranibizumab as needed per the disease activity. BCVA from baseline to month two was +5.7 letters in the treatment arm and +2.9 letters in the sham arm. Additionally, the mean gain in BCVA at month 12 ranged from +5.6 to +14.5 letters in the treatment arm vs. +5.7 to +10.5 letters in patients in the sham arm. Patients at month 12 in the treatment arm had a mean change in central subfield thickness (CSFT) of -79.4 to -181.7 microns vs. -51.5 to -165.2 microns in patients in the sham arm. Patients in the treatment arm received an average of 6.7 injections of a total possible of 12 while the sham arm received an average of 5.7 injections of a total possible of 10. The safety profile of ranibizumab was within the parameters of the previous studies of anti-VEGF agents used in patients with DME, nAMD, and ME in RVO. The authors found that the treatment with ranibizumab in cases with ME from less common causes, specifically those with inflammatory conditions or post-surgical, was beneficial except for central serous chorioretinopathy. This study was not able to assess the long-term treatment effects of ranibizumab vs. sham injections due to the potential of under treatment if sham injections were performed longer than one month. Staurenghi G, Lai TYY, Mitchell P, et al. Efficacy and safety of ranibizumab 0.5 mg for the treatment of macular edema resulting from uncommon causes: twelve-month findings from PROMETHEUS. Ophthalmology. 2018;125(6):850-62. ANSWER TO "YOU MAKE THE DIAGNOSIS"
A 29 year-old African American female presented with a chief complaint of gradual, painless unilateral vision loss, which was longstanding in nature. She did not notice any vision loss until she went to the Department of Motor Vehicles to apply for a driver's license. The patient denied any ocular trauma or complications with recent vaginal childbirth. The patient's ocular history was remarkable for compound myopic astigmatism OU and the patient's medical history was remarkable for asthma. Best-corrected visual acuity was 20/400 OD, and 20/20 OS. Dilated fundus evaluation and posterior segment photos of the right eye showed a pigmented, circular excavated hole appearing in the temporal neuro-retinal rim of the optic nerve and an elevated macula with a radiating stellate pattern surrounding the fovea. Optical coherence tomography (OCT- Zeiss 21 line raster) OD showed an accumulation of serous fluid separating the sensory retina and the retinal pigment epithelium (RPE). Cystic pockets and splitting of the inner retinal layers was also noted on OCT.
At the end of the visit, a new polycarbonate spectacle prescription was released to the patient. The patient was referred to a retinal specialist for possible laser treatment. Due to the longstanding nature of the patient's condition, guarded visual prognosis was emphasized. Patient was instructed to return to the clinic in three months for refraction and observation. 1. Ehlers, Justis P. The Wills Eye Manual: Office and Emergency Room Diagnosis and Treatment of Eye Disease. Lippincot Williams and Willkins, 2008. 282-3. 2. Sowka JW, Gurwood AS, Kabat AG. Handbook of Ocular Disease Management, 15th edition. Review of Optometry 2013; 149(6):Supplement; 1a-82a. LADDER (Long Acting DElivery of Ranibizumab) is a Phase II study to assess the efficacy and safety of three different doses of ranibizumab administered by a Port Delivery System (PDS) in patients with wet AMD. The PDS is a small, refillable implant designed for slow, continuous release of ranibizumab. Genentech has recently unveiled encouraging results that could lead to reducing the burden of multiple office visits for injections. Most PDS patients went six months or longer between the surgical implantation of the device and the first refill. The vision results, particularly in the strongest dosage, were similar to those receiving monthly injections. Phase III program is projected to start later this year. The FDA approved an early feasibility study, to take place at Wills Eye Hospital, for implantation of the Alpha AMS sub-retinal device in patients blind from retinitis pigmentosa. The device, manufactured by Retina Implant AG (Reutlingen, Germany), bypasses the damaged photoreceptor cells to activate the visual system and bring back limited vision. The Alpha AMS, unlike other implantable devices, does not necessitate a camera, but instead uses 1,600 photodiodes, which convert light into an electrical signal to employ the still-functioning optic nerve. Wills Eye Hospital plans to enroll up to eight patients and is the only participating site within North America. The Alpha AMS device has had CE Mark approval in Europe since 2016. The US FDA has given NSR-REP1, a gene therapy developed by Nightstar Therapeutics, Regenerative Medicine Advanced Therapy (RMAT) Designation. Nightstar Therapeutics is a gene therapy company focusing on rare inheritable retinal disease. Its lead product, NSR-REP1, is a treatment for choroideremia that is currently in Phase III development. RMAT designation allows for expedited advancement and approval of regenerative medicines that have the potential to reverse or cure serious or life-threatening conditions. NSR-REP1 was granted RMAT designation based on positive clinical data from Phase I and II trials, showing improved/maintained visual acuity in treated choroideremia patients. Retina-AI has developed and released the first artificial intelligence mobile app designed for eye care providers. The app, Fluid Intelligence, assists providers in determining the presence of macular edema and subretinal fluid on OCT images. Users of the app supply a photo of the OCT scan, and then Fluid Intelligence uses AI algorithms to give a clinical prediction. The app does not have the capability to diagnose the condition; rather it directs the provider as to the urgency for a retinal referral. The founder of Retina-AI, Dr. Stephen G. Odaibo, is a retina specialist that also holds degrees in mathematics and computer science. The app was developed to allow better access to care as some parts of the US and world have limited access to retinal care. Gene therapy company MeiraGTx reported that its gene therapy product AAV-CNGA3 obtained orphan drug designation from the FDA. AAV-CNGA3 is designed to restore cone function in those suffering from achromatopsia, specifically those with gene mutations in the CNGA3 gene. AAV-CNGA3 is administered through subretinal injection to target cone receptors. MeiraGTx has gene therapy focus in three areas including inherited retinal disease, xerostomia and neurodegenerative disease. The company also has orphan drug designation for AAV-CNGB3, AAV-RPGR and AAV-RPE65, all of which in the treatment of inherited retinal disorders achromatopsia (mutation in the CNGB3 gene), X-linked RP and RPE65-deficiency, respectively. Adaptive optics scanning laser ophthalmoscope (AOSLO) allows visualization of individual photoreceptors. Until now, it has been limited to study patients who have to sit upright and keep fixed gaze. Researchers at Duke University developed a handheld version of adaptive optics SLO dubbed HAOSLO. The study appears in the September edition of Optica. This small, portable device enables access to a broader range of patients such as children or those with cognitive impairment who are unable to sit for traditional AOSLO. The HAOSLO uses an algorithm to replace the wavefront sensor in traditional AOSLO. This allows for a smaller device that is less sensitive to movement. The device was tested in clinical trial on 12 adults and two children, and was able to successfully image cones close to the fovea. Central serous chorioretinopathy (image A) presents with acute detachment of the retinal pigment epithelium with or without pigment epithelial detachment, presumably due to choroidal hyperpermeability. This is often associated with Type A personality, pregnancy, hypercortisolism, systemic steroids and sleep apnea. Fundus autofluorescence (FAF) can be useful to highlight damage to the RPE and/or detect prior episodes, such as seen in the photos. The detachments generally resolve without treatment over the course of two to three months. Otherwise, treatment options include PDT, laser photocoagulation, anti-corticosteroid therapy and anti-VEGF. 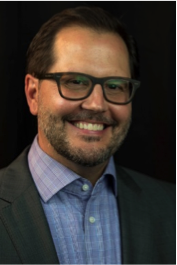 WHY BECOME AN ORS FELLOW? By Bill Denton, O.D., F.A.A.O. At some point in your career, you realize you just may be coasting. Your knowledge has been limited to the journals you receive and attempt to read, and the conferences that may not be as fulfilling as they once were. You simply need a challenge that will add an extra dimension to your professional learning. 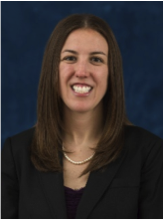 Fellowship in the Optometric Retina Society (ORS) can provide several benefits in addition to the initial challenge of qualifying for this honor. Plenty of perks accompany your induction, but the coolest part is being associated with a body of knowledge and resources which can help you in many other ways. It is not uncommon to receive weekly thought-provoking emails about challenging cases and treatment dilemmas. Some fellows like to share their awesome cases they have diagnosed, while others post their cases with hopes that other Fellows will suggest an alternative differential diagnosis. At times it is like a round-table of brainstorming, but through the use of modern technology. Fellowship has little obligation with a huge opportunity for professional growth. If you are up to the challenge of becoming a Fellow of the ORS, feel free to peruse the details and application at www.optometricretinasociety.org. Advice can be given to assist you in your quest. Feel free to contact us. Review of Optometry® is published by the Review Group, a Division of Jobson Medical Information LLC (JMI), 11 Campus Boulevard, Newtown Square, PA 19073.